For other battles at Pavia, see Battle of Pavia (disambiguation). For more details on this topic, see Italian campaign of 1524-1525. The French, in possession of Lombardy at the start of the Italian War of 1521–26, had been forced to abandon it after their defeat at the Battle of Bicocca in 1522. Determined to regain it, Francis ordered an invasion of the region in late 1523, under the command of Guillaume Gouffier, Seigneur de Bonnivet; but Bonnivet was defeated by Imperial troops at the Battle of the Sesia and forced to withdraw to France. Charles de Lannoy now launched an invasion of Provence under the command of Fernando d'Avalos, Marquess of Pescara, and Charles III, Duke of Bourbon (who had recently betrayed Francis and allied himself with the Emperor). While initially successful, the Imperial offensive lost valuable time during the Siege of Marseille and was forced to withdraw back to Italy by the arrival of Francis and the main French army at Avignon. The French advance into Lombardy and the Pavia campaign of 1524–25. French movements are indicated in blue and Imperial movements in red. In mid-October 1524, Francis himself crossed the Alps and advanced on Milan at the head of an army numbering more than 40,000. Bourbon and d'Avalos, their troops not yet recovered from the campaign in Provence, were in no position to offer serious resistance. The French army moved in several columns, brushing aside Imperial attempts to hold its advance, but failed to bring the main body of Imperial troops to battle. Nevertheless, Charles de Lannoy, who had concentrated some 16,000 men to resist the 33,000 French troops closing on Milan, decided that the city could not be defended and withdrew to Lodi on 26 October. Having entered Milan and installed Louis II de la Trémoille as the governor, Francis (at the urging of Bonnivet and against the advice of his other senior commanders, who favored a more vigorous pursuit of the retreating Lannoy) advanced on Pavia, where Antonio de Leyva remained with a sizable Imperial garrison of about 9000. The main mass of French troops arrived at Pavia in the last days of October. By 2 November, Anne de Montmorency had crossed the Ticino River and invested the city from the south, completing its encirclement. Inside were about 9,000 men, mainly mercenaries whom Antonio de Leyva was able to pay only by melting the church plate. A period of skirmishing and artillery bombardments followed, and several breaches had been made in the walls by mid-November. On 21 November, Francis attempted an assault on the city through two of the breaches, but was beaten back with heavy casualties; hampered by rainy weather and a lack of gunpowder, the French decided to wait for the defenders to starve. In early December, a Spanish force commanded by Ugo de Moncada landed near Genoa, intending to interfere in a conflict between pro-Valois and pro-Habsburg factions in the city. Francis dispatched a larger force under the Marquis of Saluzzo to intercept them. Confronted by the more numerous French and left without naval support by the arrival of a pro-Valois fleet commanded by Andrea Doria, the Spanish troops surrendered. Francis then signed a secret agreement with Pope Clement VII, who pledged not to assist Charles in exchange for Francis's assistance with the conquest of Naples. Against the advice of his senior commanders, Francis detached a portion of his forces under the Duke of Albany and sent them south to aid the Pope. 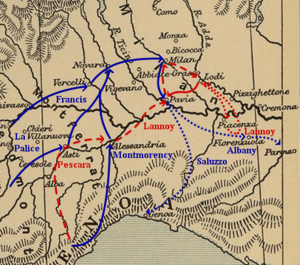 Lannoy attempted to intercept the expedition near Fiorenzuola, but suffered heavy casualties and was forced to return to Lodi by the intervention of the infamous Black Bands of Giovanni de' Medici, Italian mercenaries which had just entered French service. Medici then returned to Pavia with a supply train of gunpowder and shot gathered by the Duke of Ferrara; but the French position was simultaneously weakened by the departure of nearly 5,000 Grisons Swiss mercenaries, who returned to their cantons in order to defend them against marauding landsknechts. In January 1525, Lannoy was reinforced by the arrival of Georg Frundsberg with 15,000 fresh landsknechts and renewed the offensive. D'Avalos captured the French outpost at Sant'Angelo Lomellina, cutting the lines of communication between Pavia and Milan, while a separate column of landsknechts advanced on Belgiojoso and, despite being briefly pushed back by a raid led by Medici and Bonnivet, occupied the town. By 2 February, Lannoy was only a few miles from Pavia. Francis had encamped the majority of his forces in the great walled park of Mirabello outside the city walls, placing them between Leyva's garrison and the approaching relief army. Skirmishing and sallies by the garrison continued through the month of February. Medici was seriously wounded and withdrew to Piacenza to recuperate, forcing Francis to recall much of the Milan garrison to offset the departure of the Black Band; but the fighting had little overall effect. On 21 February, the Imperial commanders, running low on supplies and mistakenly believing that the French forces were more numerous than their own, decided to launch an attack on Mirabello Castle in order to save face and demoralize the French sufficiently to ensure a safe withdrawal. The times given here are taken from Konstam's reconstruction of the battle. The Battle of Pavía by Juan de la Corte. 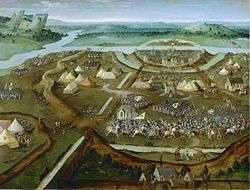 On the evening of 23 February, Lannoy's imperial troops, which had been encamped outside the east wall of the park, began their march north along the walls. At the same time, the Imperial artillery began a bombardment of the French siege lines—which had become routine during the extended siege—in order to conceal Lannoy's movement. Meanwhile, Imperial engineers quickly worked to create a breach in the park walls, at the Porta Pescarina near the village of San Genesio, through which the Imperial army could enter. 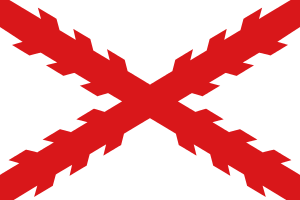 By 5:00 am, some 3,000 arquebusiers under the command of Alfonso d'Avalos had entered the park and were rapidly advancing on Mirabello Castle, where they believed the French headquarters to be; simultaneously, Imperial light cavalry spread out from the breach into the park, intending to intercept any French movements. Meanwhile, a detachment of French cavalry under Charles Tiercelin encountered the Imperial cavalry and began a series of skirmishes with them. A mass of Swiss pikemen under Robert de la Marck, Seigneur de la Flourance moved up to assist them, overrunning a battery of Spanish artillery that had been dragged into the park. They missed De Vasto's arquebusiers—who had, by 6:30 am, emerged from the woods near the castle and swiftly overrun it—and blundered into 6,000 of Georg Frundsberg's landsknechts. By 7:00 am, a full-scale infantry battle had developed not far from the original breach. Leather Box for the Pennant of Francis I at the Battle of Pavia The Walters Art Museum. A third mass of troops—the German and Spanish heavy cavalry under Lannoy himself, as well as d'Avalos's Spanish infantry—had meanwhile been moving through the woods to the west, closer to where Francis was encamped. The French did not realize the magnitude of the Imperial attack for some time; however, by about 7:20 am, d'Avalos's advance had been spotted by a battery of French artillery, which commenced firing on the Spanish lines. This alerted Francis, who launched a charge against Lannoy's outnumbered cavalry with the entire force of French gendarmes, scattering the Spanish by 7:40 am. Francis's precipitate advance, however, had not only masked the fire of the French artillery, but also pulled him away from the mass of French infantry, commanded by Richard de la Pole, and by Francois de Lorraine, who led the Black Band of renegade landsknecht pikemen (not to be confused with the Italian mercenary company of arquebusiers by the same name), which was 4,000 to 5,000 men strong. D'Avalos, left in command of the Spanish forces after Lannoy had followed the retreating cavalry, formed his men up at the edge of the woods and sent messengers to Bourbon, Frundsberg, and De Vasto requesting assistance. Frundsberg meanwhile mauled the heavily outnumbered Swiss infantry opposing him; Tiercelin and Flourance were unable to hold their troops together, and the French foot began to flee the field. Battle of Pavia by Juan de Orea. By 8:00 am, a mass of Imperial pikemen and arquebusiers descended on the French cavalry from all sides. Lacking room to maneuver by the surrounding woods, the French gendarmes were surrounded and systematically killed. Richard de la Pole and Lorraine, advancing to assist Francis, were met by Frundsberg's arriving landsknechts; the French infantry was broken and routed, and de la Pole and Lorraine were both killed. In a particularly bitter contest between Imperial and renegade landsknechts, the Black Band was surrounded by Frundsberg's pikemen and exterminated where it stood. 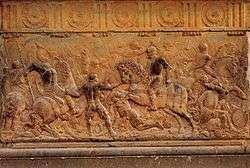 The French king fought on as his horse was killed from under him by Cesare Hercolani, an Italian Condottiere; surrounded by Spanish arquebusiers, he was taken prisoner and escorted from the field. Meanwhile, Antonio de Leyva had sortied with the garrison, overrunning the 3,000 Swiss under Montmorency that had been manning the siege lines. The remnants of the Swiss–both Montmorency's and Flourance's—tried to flee across the river, suffering massive casualties as they did. The French rearguard, under the Duke of Alençon, had taken no part in the battle; when the Duke realized what had occurred in the park, he quickly began to retreat towards Milan. By 9:00 am, the battle was over. Soon afterwards, he finally learned that the Duke of Albany had lost the larger part of his army to attrition and desertion, and had returned to France without ever having reached Naples. The broken remnants of the French forces, aside from a small garrison left to hold the Castel Sforzesco in Milan, retreated across the Alps under the nominal command of Charles IV of Alençon, reaching Lyon by March. 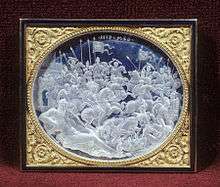 In Rome Cardinal Ippolito de' Medici, who acted as Florentine emissary to Charles V in 1535, expressed support for the Emperor's victory by commissioning a rock crystal low relief in the manner of an Antique cameo, from the gem engraver Giovanni Bernardi. The classicizing treatment of the event lent it a timeless, mythic quality and reflected on the culture and taste of the patron. An oil-on-panel Battle of Pavia, painted by an anonymous Flemish artist, depicts the military engagement between the armies of Charles V and Francis I. Because of its detail, the painting is considered an accurate visual record, probably based on eyewitness accounts. A suite of seven Brussels tapestries after cartoons by Bernard van Orley (left) celebrate the Imperial–Spanish victory. 1 2 Knecht, R. J. (1994). Renaissance Warrior and Patron. New York: Press Syndicate of University of Cambridge. p. 225. ↑ Konstam, Pavia 1525, 89. ↑ Konstam, Pavia 1525, 30—33. ↑ Konstam, Pavia 1525, 34. ↑ Konstam, Pavia 1525, 34–35. ↑ Konstam, Pavia 1525, 36–39. ↑ Konstam, Pavia 1525, 40–41. ↑ Blockmans, Emperor Charles V, 57; Konstam, Pavia 1525, 42–43. ↑ Konstam, Pavia 1525, 43–45. ↑ Blockmans, Emperor Charles V, 59; Konstam, Pavia 1525, 46–50. ↑ Konstam, Pavia 1525, 50. ↑ Konstam, Pavia 1525, 52–53. ↑ Konstam, Pavia 1525, 56–57. ↑ Konstam, Pavia 1525, 56–58. It is unclear whether the breach was in the east wall of the park or the north one; Konstam, based on an analysis of the later course of the battle, suggests that the north is the more likely option. ↑ Konstam, Pavia 1525, 58–61. ↑ Konstam, Pavia 1525, 62–63. ↑ Konstam, Pavia 1525, 63–65. 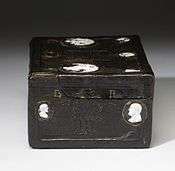 ↑ "Leather Box for the Pennant of Francis I at the Battle of Pavia". The Walters Art Museum. ↑ Konstam, Pavia 1525, 65–69. ↑ Konstam, Pavia 1525, 69–72. ↑ Archived 25 April 2007 at the Wayback Machine. ↑ Konstam, Pavia 1525, 72–74. ↑ Konstam, Pavia 1525, 74. 1 2 Konstam, Pavia 1525, 76. ↑ Guicciardini, History of Italy, 348. ↑ Birmingham Museum of Art : guide to the collection. Birmingham, Ala: Birmingham Museum of Art, 2010.